This popular guide to the important elements that must be considered in the design of wastewater treatment works is newly revised (May 2016) to reflect the need for resiliency in the face of storm surge and extreme weather. It is available in print, on disk, or USB drive. The manual was completely revised in 2011 to reflect current practices and to include advances in technology, nutrient removal, energy efficiency, and instrumentation. 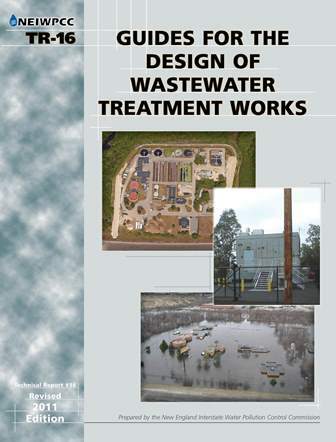 The guide is written for engineers who design wastewater treatment plants, state regulators who review and approve designs, and municipalities that are soliciting professional design services for wastewater treatment facilities. TR-16 is NEIWPCC’s most-requested document. The 2016 revision adds key concepts and criteria related to flooding, storm-surge, and extreme weather. The revision primarily affects just a few chapters. Two documents available for download explain what the TR-16 Guide includes. The Table of Contents and introductions to the current edition describe the guide and each of its chapters. “What’s New in the Revised Edition” highlights changes in the Revised 2011 Edition, and is meant to act as a companion document for those who still have the original 2011 version. To order your TR-16 Guide, call NEIWPCC at (978) 323-7929, download the order form, or e-mail us at mail@neiwpcc.org. TR-16 costs $95.00 per copy (hard copy) or $25.00 (CD or USB). These prices include shipping and handling (U.S. Media Mail), and all orders will reflect the 2016 revisions. Purchase a copy of the TR-16 (credit card purchases only). The wastewater manager who is tasked with planning for extreme weather events faces challenges both critical and difficult. 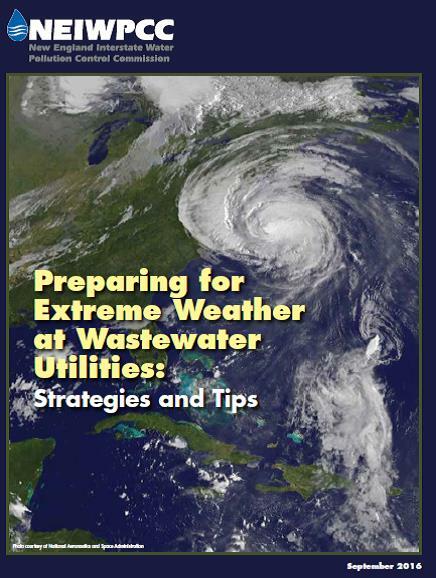 This guide can help, with a description of the central issues and with tips and stories gleaned from the experience of wastewater professionals in the Northeast. The goal of this publication is to orient the reader to the problem of emergency preparation and to offer many points of departure for further information. The material is organized generally by time period, starting with prestorm planning and ending with post-storm assessment and repair. The focus of this guide is on operations. Wastewater professionals interested in design issues related to extreme weather may wish to consult NEIWPCC’s Guides of the Design of Wastewater Treatment Works (Technical Report 16). This design guide has been recently revised to incorporate the latest thinking about resiliency and adaptation in the siting and design of physical plant.